Importance of the ritual of Shraaddh? What is the importance of the ritual of Shraaddh? The ritual of Shraaddh not only repays debts towards deceased ancestors, but also makes it easy to repay debts towards God and Sages. Sages are considered to be hot tempered in comparison to God and due to this nature they could curse one and thus entrap the embodied soul. However as debts towards ancestors need to be repaid by actions, it becomes simple and easy to repay these debts through the ritual of Shraaddh. Therefore, in order to be able to repay other debts in a good manner, it is necessary that everyone relies upon debts towards ancestors that act as link between God and Sages, satisfy them by performing these rituals and try to embark upon the progress towards attaining final liberation. 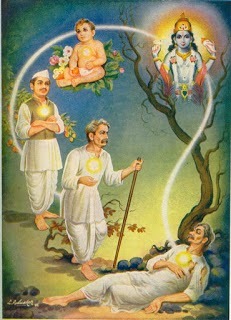 By performing the ritual of Shraaddh, with the help of the ancestors’ souls one can slowly progress towards reaching God and Sages and by the virtue of combined support from Vasu,Rudra and Aditya (Vasu means aspirations, Rudra means dissolution and Aditya means radiance or action), one can provide momentum to the deceased father, grandfather and great grandfather and in turn acquire blessings from God. The term ‘Shraaddh’ is completely linked with Maya (The Great Illusion) and Brahman (the Creator) through the bond of debts that need to be repaid. When the threads of the give and take relationship that binds us, dissolve, and then at that time the embodied soul gets liberated and only then it can acquire momentum to progress towards attaining Final liberation. Therefore through the ritual of Shraaddh one can get rid of the bonding with others and get liberated in this birth itself under observer stance of the followers of Lord Vishnu. The word ‘Shraaddh’ conjures up an incorrect impression in the minds of the younger generation who belong to the modern scientific age. They see it as a case of unnecessary importance being given to a non-scientific and largely meaningless ritualistic procedure. Absence of Dharma education (which means ‘Righteousness from a spiritual perspective’) along with a lack of any inclination towards learning about spirituality, a high level of influence of foreign cultures and a continuous barrage of criticism with a strong underlying hatred for Hindu traditions and customs by unrighteous organizations, has caused this effect. People, who lack faith in ritualistic worship or Shraddha and consider social service superior, have very naïve views. 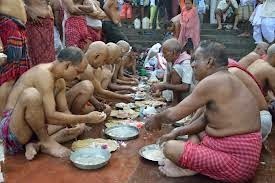 They feel that instead of performing Shraaddh for deceased ancestors, they would rather donate food to the poor or provide help to schools. Of course, many of these people do not act upon their own views by actually put them into practice. In addition they are also unaware that doing this is as ludicrous as saying, ‘Instead of performing surgery to treat a particular disease, we will donate food to the poor or provide help to the schools’. The spiritually potent mantras that are chanted during the ritual of Shraaddh have the subtle power of providing momentum to the subtle bodies of deceased ancestors therefore they can progress to a higher sub-plane of existence after the ritual is performed. In view of this one can easily see the folly in maintaining the uninformed views mentioned above. Therefore the aim of this book is to eliminate the blindfold of ignorance that such people have and to change their thinking so they may develop a positive and spiritual view towards the sacred ritual of Shraaddh which is prescribed by the Hindu religion. Indian culture teaches us that we have to perform certain duties towards our parents and close relatives after their death, just as we serve them when they are alive as a part of obeying our Dharma. The ritual of Shraaddh provides us with an excellent mechanism to fulfil our duties and in turn repay our debts towards ancestors. Our parents have taken the utmost care of us during our childhood. The ritual of Shraaddh is necessary so that their journey after their death is full of comfort and devoid of any distress and that they acquire momentum, which allows them to progress to a higher sub-plane. If Shraaddh is not performed, the desires of the deceased ancestors remain unfulfilled. The negative energies make easy victims of such desire riddled ancestors souls and then make them their slaves. In all likelihood, they then use them to cause distress to their own family members. By performing Shraaddh, one gets relieved from the distress caused by the ancestors’ souls thereby enabling oneself to lead a comfortable life on earth. If one performs Shraaddh on a particular day, date (as per the Hindu calendar) as per the position of the stars (nakshatra), then apart from one’s duty towards ancestors getting fulfilled, some specific benefit can also be derived. The importance and benefits of performing Shraaddh have been elaborated through such various aspects in this book. Why should every son perform ritual of Shraaddh? A. Providing momentum to the deceased ancestors present in the Pitru region so that they can progress to a higher sub-plane of existence, through the means of Shraaddh. B. Satisfying wishes and desires of the souls of the deceased ancestors from ones' family who are trapped in the negative regions due to unfulfilled desires and providing momentum for their further progress. C. Some deceased ancestors, due to their evil deeds, become ghosts and reside in hell instead of nether region. Through the medium of ritual of Shraaddh, one can relieve them from being trapped in this form. A. Repaying the debt to ancestors is as important as repaying the debt to God, Sages and the society. It is the duty of descendants to respect their ancestors, make donations in their name and to undertake activities that will please them. Performing Shraaddh is a part of obeying Dharma, as per science of Dharma. Meaning: The son protects his ancestors' souls from the Hell named 'Puta'. Therefore Lord Brahma himself has named him as 'Putra'. As per the above verse, to enable the deceased ancestors to progress to a higher sub-plane, to relieve them from experiencing severe and everlasting distress and to initiate them to bestow grace on their descendants, every son should perform ritual of Shraaddh. It is amply clear in the verse that the one who is believed to be a son, he should perform these duties. Meaning: One should not commit mistakes in any task performed towards God or ancestors' souls. One should not avoid these rituals. meaning that nothing is as superior as the ritual of Shraaddh. Therefore, a person having a pure intellect to discriminate between right and wrong should never abstain from performing Shraaddh. F. Brahmavaivarta Puran says, 'Activities related to deceased ancestors are more important than those related to God'. Therefore every sacred ceremony begins with Nandi Shraaddh. G. Brahma Puran says, 'One who performs the ritual of Shraaddh diligently and in accordance with ones financial state, he satisfies everyone right from Lord Brahma to the insignificant blade of grass. No one in the family of the person performingShraaddh remains unhappy. H. If soul of a deceased person wishes that 'someone should perform Shraaddh for me' and if it does not get fulfilled from the expected descendant, then it becomes unhappy due to non-fulfilment of the desire. Such soul can transform into an evil spirit (a type of negative energy) and cause distress to its relatives for not performing the ritual of Shraaddh. I. At the time of death if a person feels, 'Shraaddh is meaningless and nobody should perform Shraaddh for me after my death' and later because of Shraaddh having not been performed, after his death, he experiences that, 'I am trapped', even then he cannot convey this feeling to anyone. He could become unhappy because of his wish remaining unfulfilled. Taking this point into consideration, it is absolutely necessary to perform Shraaddh for every deceased person. J. By performing ritual of Shraaddh for a deceased person, the give-and-take account that exists with that person gets fulfilled, e.g. if we owe something to a person and he dies before we could repay him, then by the virtue of performing Shraaddh the loan can be repaid. K. In the current age, people do not perform rituals like Shraaddh or spiritual practice the way it used to be done earlier. Therefore most of the people experience distress due to unsatisfied ancestors' souls. Only spiritually evolved (saints) can tell us if we are suffering due to distress caused by ancestors' souls or if we might face such distress in the future. 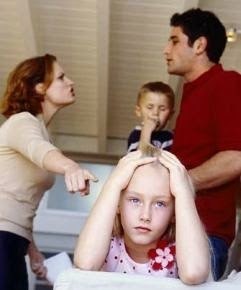 Regular clashes between the family members, unable to cope up any family member, unemployment, unable to save any money, serious illness, unable to get married in spite of all favorable conditions, unable to cope up with the partner after marriage, unable to conceive, abortion, giving birth to a physically or mentally handicapped baby and developing addictions. [The distress caused to us descendants by ancestral spirits manifests in many ways in our day-to-day lives. It creates obstacles in both, our worldly lives as well as spiritual practice. In some cases, it may seem that the entire family has a dark cloud over it and various family members are undergoing various problems despite all efforts to overcome them. The difficulties that are created due to ancestral spirits come in various forms such as marital disharmony, addictions, miscarriages and financial problems. At an intellectual level, we can use two rules of thumb to decide if the cause of suffering is spiritual in nature. The first rule is if all remedies to solve the problem have failed. This is especially so when the problem should be easily treatable by modern sciences. The second rule is if a number of family members (e.g. 4 out of 5) are suffering with any of the above mentioned issues simultaneously. By performingShraaddh one gets relieved from the distress caused by the deceased ancestors since the deceased ancestors get satisfied and if they are trapped in a particular region, they get momentum to progress to a higher sub-planes and in turn the descendants are able to obtain their blessings. Meaning: One can conceive a baby boy and acquire a long life, success, heaven, fame, strength, wealth, animals, happiness, food, etc. by worshipping (performing Shraaddh for) deceased ancestors. What are the presiding deities and results of Shraaddh? 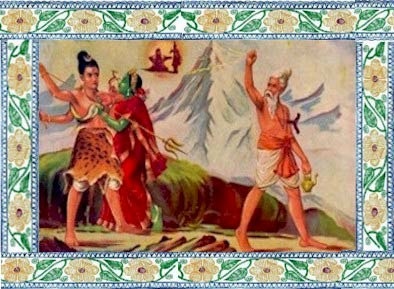 Pururav-Aardrav and Dhurilochan are deities of ancestors’ souls. They are referenced in the ritual of Shraaddh. 2. The deceased person for whom the ritual of Shraaddh is being performed is considered as a follower of Vasu, his parents are considered as followers of Rudra and his grandparents are considered as followers of Aditya. Therefore during Shraddha, the names of father, grandfather and great grandfather (or mother, grandmother and great grandmother) are pronounced as representatives of Vasu-Rudra-Aditya respectively. 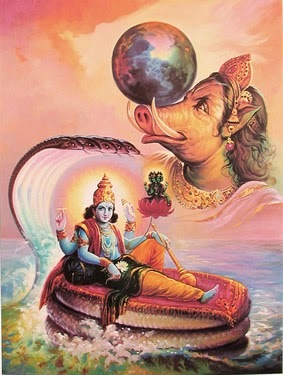 Matsya Puran mentions 'नित्यं नैमित्तिकं काम्यं त्रिविध श्राद्ध मुख्यते ।', meaning, primarily there are three types of Shraddha - one performed daily, periodically and with purpose (Kamya). In addition to these, Yamasmruti defines Nandi Shraddha and ParvanShraddha as additional main types. The ritual of Shraddha performed daily is known as Daily Shraddha. This Shraddha can be performed just by offering water or sesame seeds to deceased ancestors. The shraddha performed for deceased ancestors with a single objective and other such types fall under periodic Shraddha. Shraaddh performed for achieving a specific objective is termed as purpose oriented (Kamya) Shraaddh. Gaining a good fowl and being able to give birth to a healthy baby boy. Conceiving bright male child, getting success in gambling. 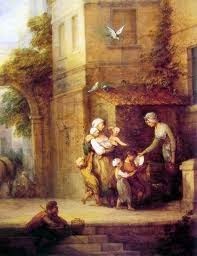 Acquiring utensils, clothes and a scholar male child. The persons, who have died due to the stroke of a weapon or on a battlefield, get momentum to attain a higher sub-plane. Gaining good citizens. Note : Except full moon night, all other dates that belong to the dark fortnight and corresponding dates in dark fortnight of the month of Bhadrapad, bestow special benefit. If one is not able to conceive or is facing problems of abortion, then for the well being of the fetus,Shraddha is performed or offering of water is made to Bhishmacharya, on the eighth day of the bright fortnight (Bhimashtami) in the Hindu calendar month of Magh. Acquiring a heavenly abode for oneself and ones son. Providing momentum to the soul of an evildoer, action transformed into supernatural power. Earning profit in business, earning success. Achieving supernatural powers in medical practice, acquiring metal other than gold and silver. Acquiring a flock of sheep or lamb, acquiring metal other than gold and silver. When an evildoer dies and Shraddha is performed for him at the time of Aadra star, for imparting momentum to its soul, the desired benefit can be derived. In the table given in point 2 and 3, multiple benefits are indicated for a single date or star position. These are specified based on references obtained from different books. The ritual of Shraddha performed during the start of any joyous ceremony and performance of any of the 16 religious rites, and recitation of specific mantras for success of the ceremony is called Nandi Shraddha. In this ritual Satyavasu (or kratudaksha) are the vishve deities and the father-grandfather-great grandfather, mother-grandmother (mother’s mother) - great grandmother (mother’s grandmother) and mother- grandmother (mother’s mother-in-law)-great grandmother (mother-in-law of mother’s mother-in-law) are invoked. 1. Karmanga Shraaddh: This Shraddha is performed during the religious ritual of Garbhadhan. 2. Vruddhi Shraaddh: Shraddha performed at the time of birth of a baby. The Pindapitruyagna (sacrificial fires related to deceased ancestors) mentioned in the Shrout lineage is to be performed by a Sagnik (one who performs the ritual of Agnihotra). Alternative to this is the Parvan Shraddha mentioned in the Gruhya sutras. Once the deceased ancestors get listed as Parvans, then this shraddha is performed for them. Ekparvan (single Parvan), dviparvan (double Parvan), triparvan (triple Parvan) are the three varieties of this shraddha. Mahalay Shraddha and Tirtha Shraddha are the types of Parvan Shraddha. 1. Mahalay Shraaddh (fortnightly): It is a Parvan Shraaddh performed starting from the eleventh day of dark fortnight ofBhadrapad (Hindu calendar month) till the no moon night. 2. Tirtha Shraaddh: The ritual of shraddha performed at Holy places like Prayag or at the banks of a sacred river is termed asTirtha Shraaddh. While performing Tirtha Shraaddh, all the Parvans of Mahalay are invoked. The Shraaddh performed by the group of priests (Brahmins) and scholars at a holy place with the intention that, ‘Deceased ancestors’ souls should get satisfied and let happiness and prosperity preside’, or while discussing the topic of Shraaddh, if one gets inspired all of a sudden and performs Shraaddh, then such Shraaddh is termed as Goshthi Shraaddh. 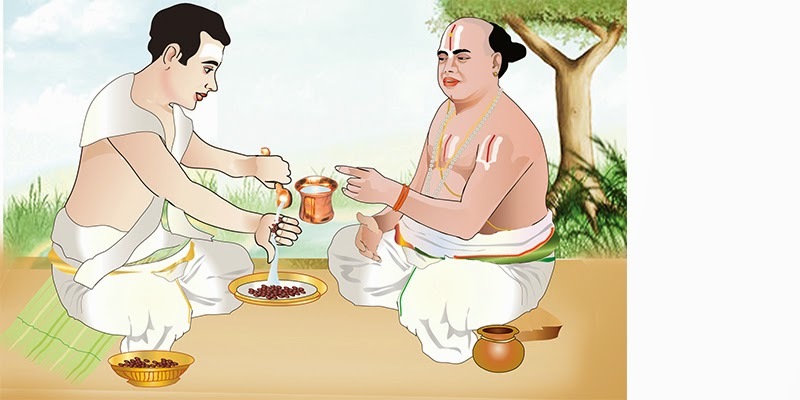 Offering food to priests (Brahmins) for acquiring purity is called as Shuddhi Shraddha. This is the ‘undergoing of punishment’ part of Shraddha. 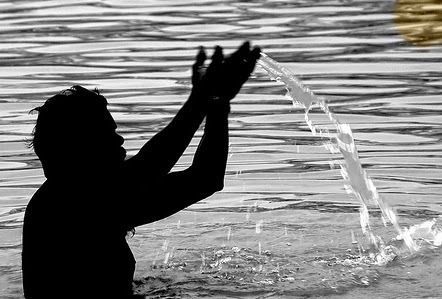 Shraddha performed for increasing physical strength and prosperity is called as Pushti Shraddha. Shraddha performed using ghee (clarified butter), in remembrance of deceased ancestors, before embarking on a journey to holy places with the objective of completing the journey without any obstacles is called Ghruta Shraddha. Shraaddh performed after returning from a journey to holy places is termed as Dadhi Shraaddh. Shraaddh performed on 8th day of the bright fortnight of the Hindu calendar month. Ashtaka means the 8th day of bright fortnight of any Hindu calendar month. During the era of Vedas, the Ashtaka Shraaddh used to be performed specifically on the 8th day of bright fortnight of Margashirsha, Poush, Magh and Falgun months. It was a practice to offer vegetables, meat, bondas, sesame seeds, honey, rice kheer, fruits and underground vegetables to deceased ancestors. Vishvedev, Fire (Agni), Sun, Prajapati, Ratri, Stars (nakshatra), season (rutu) etc. were considered as deities of Shraddha. Shraaddh performed with the objective of obtaining the grace of God is termed as Daivik Shraaddh. 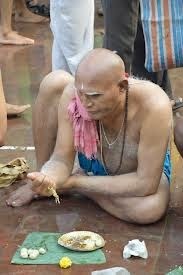 This Shraaddh is performed without offering food and only by offering money (dakshina) to the priests (Brahmins). If food is in scarcity, then gold, equivalent to four times the cost of the food grains, should be offered. Those people who do not have children or whose children are atheists, they should perform Shraaddh for themselves when they are alive. The rites for such Shraddha are explained in the science of spirituality. Even though various types of Shraaddh are mentioned above, based on the calendar days, the Shraaddh performed for a dead person from the first day to the eleventh day, monthly shraaddh, Sapindikaran Shraddha, Shraaddh performed on one-year completion, Shraaddh performed every year from the second year and Mahalay Shraddha are the only ones that are commonly practiced. 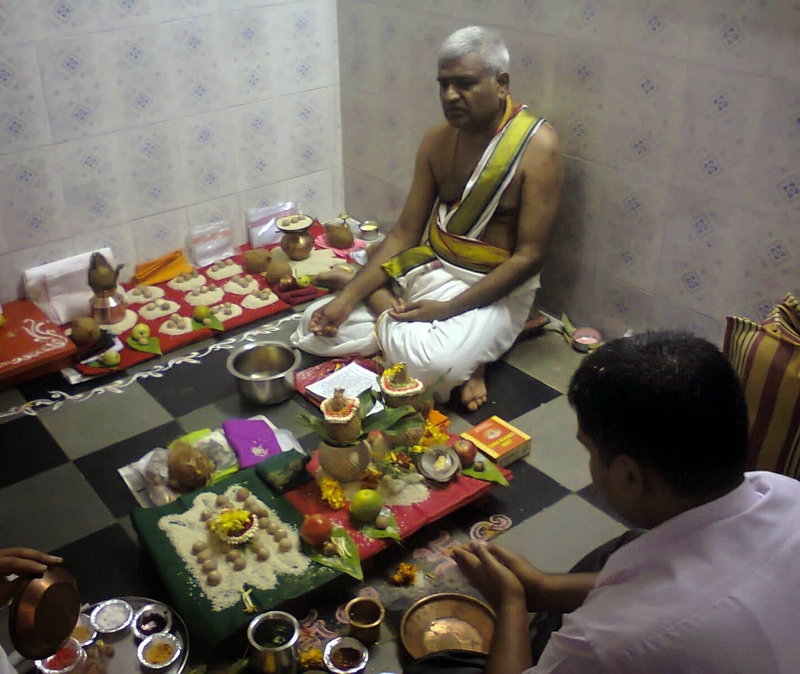 ‘Ideally, the host should perform the ritual of Shraaddh by himself. However, since we do not know how to perform it, we get it done through the priest (Brahmin). Nowadays, it has become difficult to get priests for performing Shraaddh. As a solution to this, one can procure the holy texts that describe the ritual and learn it by heart. This text is in Sanskrit. Akin to learning other languages, one should also try and learn Sanskrit, which is considered to be God’s language. Also, it is easy to learn Sanskrit. Hindu Dharma that does not give any cause for excuse for not performing shraaddh due to the absence of a particular person! Son (including the one whose threading ceremony has not been done), daughter, grandson, great grandson, wife, daughter’s son (if he is one of the heirs), real brother, nephew, cousin’s son, father, mother, daughter-in-law, son of elderly and younger sisters, maternal uncle, anyone in the seven generations and from the same lineage (sapinda), anyone after the seven generations and belonging to the same family domain (samanodak), disciple, priests (upadhyay), friend, son-in-law of the deceased person can perform Shraddha in that order. Hindu Dharma has made arrangement so that for each and every dead person the shraaddh can be performed so as to give momentum to that person to progress to a higher sub-plane. Holy text Dharma Sindhu mentions that, ‘If a particular dead person does not have any relative or a close person, then it is the duty of the king to perform Shraaddh for that person’. Above it is mentioned that the daughter, wife, mother and daughter-in-law of the deceased person have the authority to perform Shraaddh. In spite of this, in the current era, the priests who conduct Shraaddh deny their consent for females to perform Shraaddh. This could be because in the earlier days the thread ceremony was performed for females, and in current era, this practice has been discontinued in all classes. Therefore, in accordance to that, even performing of Shraaddh has been disallowed for females. 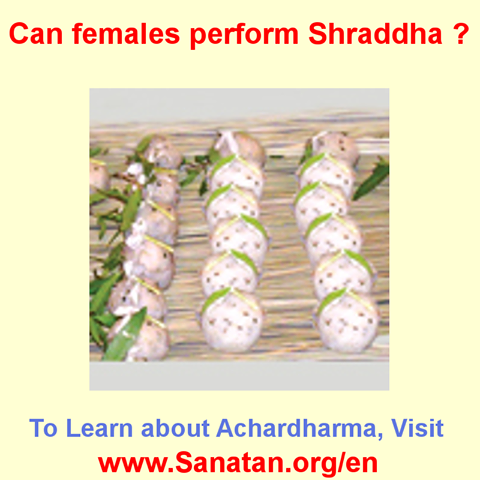 In emergency conditions, however, if no one is available for performing Shraaddh, then it is better for it to be performed by females instead of not performing it at all. When should the Shraaddh be performed? Normally, no moon night, 12 sankrants in a year, solar-lunar eclipses, Yugadhi and Manvadi dates, Ardhodayadi parva, date of death, arrival of Shrotriya priests (Brahmins) etc dates are considered appropriate for performing shraddha. 2. Hindu Dharma does not give any chance to anyone to say that the shraddha was not performed due to non-feasibility in a particular period! · Normally every year Shraddha should be performed on the date of death of the person (as per the Hindu calendar and not as per the English calendar.) If the date is not known and only the month is known, then in that case the shraddha can be performed on the no moon night of that month. 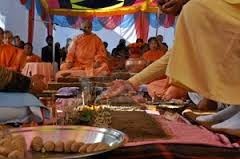 · If both, the date as well as the month is unknown then the shraddha can be performed on the no moon night of the Hindu calendar month of Magh or Margashirsha. · If the definite date of death is not known then the shraddha can be performed on the date when the news of the death was received. · Shraddha for deceased ancestors’ souls should be performed everyday and it can be achieved just by offering water (tarpan) to them. · If it is impossible to perform Shraddha daily, then Darsha Shraddha should be performed. This fulfills the requirement of doing the Shraddha daily. Darsha means no moon night. Therefore Darsha Shraddha is the one, which is performed on the no moon night of every month. · If it is not possible to perform Darsha Shraddha every month, one should at least perform it on the no moon night of Hindu calendar months of Chaitra, Bhadrapad and Ashwin months. If the day is divided into 5 parts, then the fourth part is called the ‘Aparanha’ period. This period is most appropriate for performingshraddha. Lord Brahma’s day is considered as the day of origin. This is also called as Kalpadi tithi. The 1st and 5th day of Chaitra, 3rd day of Vaishakh, 7th day of Kartik, 9th day of Margashirsha, 13th day of Magh, 3rd day of Falgun (all days from the bright fortnight) indicate the start of the era (kalpa). As per the science, if shraddha is performed on these dates, the deceased ancestors’ souls get satisfied. Akshayya Trutiya indicates the start of the Kruta era. The benefits derived by performing rituals like Shraddha, Tarpan for deceased ancestors’ souls and donations on this date is everlasting. Therefore one should at least perform Apinda Shraddha or Tarpan for their deceased ancestors’ souls. The holy texts of Puranas say that, on the day of Akshayya Trutiya one should donate uncooked food (aamanna), a water pot, a fan made of mint grass, an umbrella, footwear etc with the intension of offering them to the deceased ancestors’ souls. It is mentioned in Garud Puran that, once the donations are made with the intention of offering them to deceased ancestors’ souls on this day, the messengers of Lord Yama do not cause distress to the ancestors’ souls. When clothes and ornaments are donated, the dark, brown eyed, cruel messengers of Lord Yama having sharp and long teeth do not cause distress to the deceased ancestors’ souls. 1. The dark fortnight in the Hindu calendar month of Bhadrapad is called as ‘Pitrupaksha’. This fortnight is very dear to the deceased ancestors’ souls. If Mahalay Shraddha is performed for the deceased ancestors’ souls during this fortnight, they remain satisfied for the entire year. The householder who does not perform shraaddh during the period when the Sun is in the Virgo sign, how will he earn money and be gifted with a baby boy as he would have enraged the deceased ancestors’ souls? Additionally, the abode for deceased ancestors’ souls remains vacant till the Sun moves from Virgo and Libra sign to the Scorpio sign. The abode for deceased ancestors’ souls remaining vacant during this period implies that the deceased ancestors’ souls come closer to their descendants for blessing them and if Shraddha is not performed, they give curse to their descendants and return. Due to this it is important to perform Shraddha during this period. How does an embodied soul get entangled in its desires after death? From a spiritual perspective the Krushnapaksha (the dark fortnight of Bhadrapad), which is also known as Pitrupaksha (a time particularly dedicated to the performance of shraaddh rituals) has special importance. It is also known as Mahalaya in the Hindu religious Scriptures. It is necessary to perform the ritual of offering water to the departed ancestors (Pitrutarpan) during the fifteen days from full moon day (Pournima) in Bhadrapad to the no moon day (Amavasya) inBhadrapad and on the specific tithi, the shraddha of the ancestors should be performed. By doing shraddha in Pitrupaksha the ancestors are satiated for the whole year. A quote from Mahabharat elucidates the importance of performing shraddha for the departed ancestors. How will a householder who does not perform shraddha while the sun is stationed in the Kanya, that is, Virgo sign and thereby invites the ire of the departed ancestors, acquire wealth, son etc.? Similarly, till the time the sun does not enter the Vruschik, that is, Scorpio sign from the sign of Kanya, that is, Virgo and Tula, that is, Libra, till then the Pitruloka (the subtle region where the subtle bodies of the departed ancestors go) remains vacant. The Pitruloka being vacant means that during this period all the departed ancestors of the lineage descend and come close to their descendents to bless them. They curse the descendants and leave if shraddha is not performed by the descendants. · Father, paternal grandfather and paternal great-grandfather – They are known as the Pitrutraya. · Mother, maternal grandmother and maternal great-grandmother – They are known as the Matrutraya. · One’s mother's father, one's mother's maternal grandfather and one's mother's maternal great grandfather – They are known as the Matamahatraya. · Wife, Sons, Daughters, Paternal uncles, Maternal uncles, Brothers, Paternal aunts, Maternal aunts, Sisters, Father-in-law, Other relatives, Guru (if one has a Guru-disciple relationship), disciple (if one has a Guru-disciple relationship). 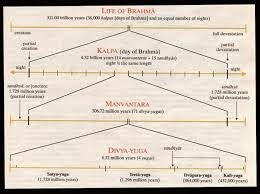 Only the Hindu Dharma has done such profound study about the well-being and evolution of a Jiva even after death. Most of the people consider the ‘Shraddha’ to be of no use. 99 % of the people who perform shraddha do it merely as a custom. Only theshraddha done with spiritual emotion is beneficial. The meaning of shraaddh: Whatever is done faithfully for repaying what the departed ancestors have done for us is calledshraddha. 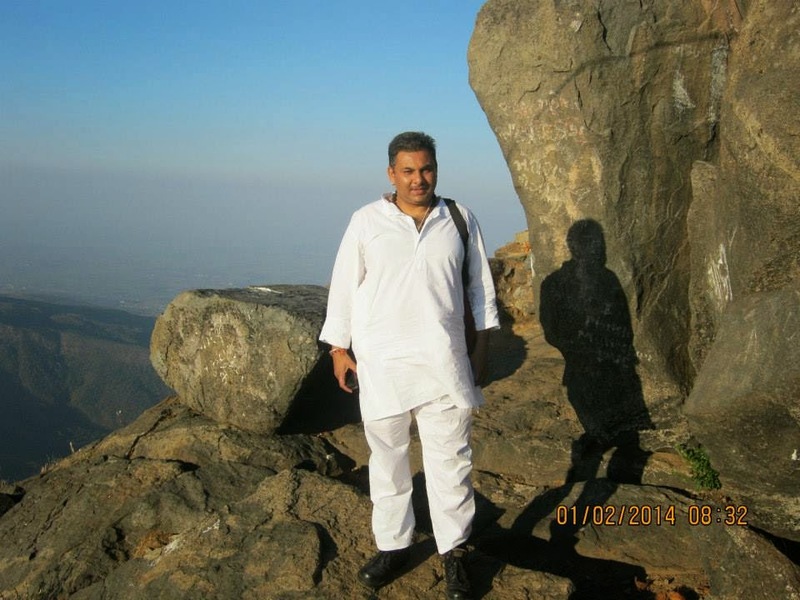 Swami Vidyanand says, “Only the shraddha done with faith is called ‘Shraaddh’”. 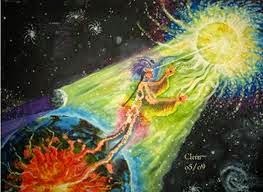 · The first is Annamaya-kosha, that is, the physical body visible to us. · The second is Pranamaya-kosha – it has the five vital energies (Panchaprana) providing energy to the whole body. · The third is the Manomaya-kosha – This is the seat of emotions and desires. · The fourth is Vidnyanamaya-kosha – This is the seat of the intellect. · The fifth is Anandamaya-kosha – This is the seat of the Soul (Atma). The Annamaya-kosha is gross while the other sheaths are subtle. After death, a Jiva’s Annamaya-kosha and Pranamaya-kosha do not remain, but Manomaya-kosha, Vidnyanamaya-kosha and Anandamaya-kosha remain with him. Hence, despite the gross body being destroyed by death, a Jiva’s existence and his desires do not end. Consequently, a Jiva gets entangled in his desires and this poses a hurdle in his further progress. After death a Jiva, that is, the subtle body constantly makes efforts for fulfilling its desires. Sometimes it enters another body forcibly. Due to desires a Jiva goes to various subtle regions (lokas) as per his actions. Despite going from one place to another, the Jiva has intense attachment to his previous place. Many a times while going from one place to another, this Jiva goes astray and keeps searching for something. The process of getting entangled in desires after death is known as hurdles in the further progress. Due to this, the responsibility of liberating the person from this process of getting entangled in desires rests with the deceased person’s family members. · Helping the embodied soul (Jiva) during his lifetime to not get trapped in desires. · Satiating the desires of the embodied soul (Jiva). · Awakening the Jiva to move ahead in his spiritual journey. · Helping the deceased ancestors to move from Pitruloka to further subtle regions (lokas). · Liberating the unsatisfied subtle bodies of one’s family trapped in the lower lokas. · Liberating the deceased ancestors turned into ghosts due to their own evil deeds from this form. The sheath of desires around the subtle body of the Jiva reduces by doing shraddha. The subtle body is given momentum through the energy of mantrashakti in the shraddha rituals. · 1. Abiding by Dharma: Along with repaying the debt of Deity, Sages and society, repaying the debt of deceased ancestors is important. A shloka of Mahabharat is notable in this respect. Son protects his deceased ancestors from the Hell named ‘Put’. Hence, Brahmadeva Himself has called him 'putra' (son). · 2. Purification of lineage: If religious conducts of the family (kuladharma) are not followed, maternal or paternal defects increase. Deceased ancestors (pitar) are protectors of the lineage. If kuladharma like the rituals of shraddha is followed, purity of the lineage is certain. · 3. Completion of give and take account: The give and take account with a person is settled by performing his shraddha. Repaying the debt of deceased ancestors is quite simple and easy through the ritual of shraaddh. This is possible by the unification of Vasu, that is, desire, Rudra, that is, dissolution (laya) and Aditya, that is, action. Thus, it is clear that the ritual of shraaddh is a necessary achar to evolve the worldly and spiritual life of a person. The deceased ancestors come to reside in the house of their relatives in the Pitrupaksha. By doing shraddha once in this fortnight, the deceased ancestors are satisfied for a year. Son, long life, health, unlimited prosperity and desired objects are acquired by performing shraddha in Pitrupaksha. The deceased ancestors grace their descendants who do shraddha. But distress those who avoid performing shraddha without due cause. If the shraddha is not performed before the sun enters the Vruschik sign, the deceased ancestors of a person puts an intense curse on him and returns back to Pitruloka. Nowadays, nobody performs shraddha-paksha, nor do they do spiritual practice. Due to the dissatisfaction of the deceased ancestors, the Jiva has to face many hardships. not getting married, marital disharmony, not conceiving, abortion, giving birth to a mentally retarded or handicapped baby, getting nightmares, seeing snakes or deceased ancestors in dreams or while awake, having obstacles in spiritual practice. Even if one doesn’t have such distress at present, one can make efforts for future protection. Efforts can be taken to give momentum to one's deceased ancestors. Our deceased ancestors could be in various forms of being and they need food according to that form of being. Except in the Earth region, food is unavailable in any other subtle region. In the ritual of Mahalaya Shraaddh, Vasu, Rudra and Aditya are the presiding Deities of the deceased ancestors. Vasu means desire, Rudra means dissolution and Aditya means Absolute Fire Principle and action. With the combination of the three, the father, grandfather and great grandfather respectively can be liberated. During the ritual of Shraaddh the Vishvedevs called Pururav-Ardrav and Dhurilochan are also invoked. Vishvedev means the ‘group of Deities which represents the Deities during a sacrificial fire’. 2. When should one perform Mahalaya Shraaddh during the Pitrupaksha? The Mahalay Shraddha is performed on the tithi of the death of the father of the person doing Shraddha during the Pitrupaksha. If the tithi is not known, perform the Shraddha on the no moon day (Amavasya) of the month of Bhadrapad according to the Shaka Samvat and according to Vikram Samvat on the Amavasya of the month of Ashwin. The person performing the Shraaddh and the person invited for the meal to be offered to Brahmin should not take meals and avoid physical relations with a woman on the previous night of the day of Shraaddh. As far as possible the Shraaddh should be performed on the ground floor of the residence. The venue of the Shraaddh ritual should be clean. First collect the list of substances required for the Mahalaya Shraddha from the ritual booklets or the priest invited for the ritual. As far as possible collect all the instruments one day in advance. 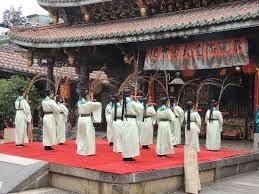 The substances essential for this ritual other than the normal substances required for a ritualistic worship are – barley, black sesame seeds, maize and basil leaves. Nowadays, two priests are invited for the ritual. One priest sits facing the north which is the place of the ancestors. The other priest sits facing the east which is the place of Gods. The person performing the Shraaddh sits facing the south-east. One more place is made for the priest narrating the ritual. Due to various incidents taking place during daily life a black covering is created on our body. From the viewpoint of gaining benefits from the ritual, some religious actions are done before commencing the ritual of Shraaddh like wearing the Holy thread, applying the Holy ash, partaking of the five substances, that is, panchagavya, sipping of water, that is, achaman etc. It is essential for the person performing the Shraddha to perform some important religious actions before the actual ritual ofShraddha. · The person performing the Shraddha should wear a white dhoti and an upavastra for the ritual. · He should commence the ritual with sipping of water, that is, achaman. · After this, he should apply Holy ash on the various parts of the body. 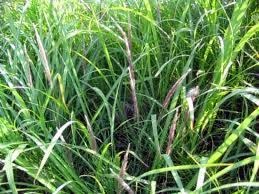 · Thereafter he should hold darbha, that is, a specific type of grass in hand and on various parts of the body. · Now he should make a ritualistic narration to God about the time period and the time of the ritual. · After this he should make a resolve for the ritual. In Mahalaya he should make a resolve for the Vishvedev called Dhurilochan. · After this he should make apasavya, that is, hold the Holy thread on the right shoulder and make a resolve for the ancestors. · In this, the person performing the Shraddha says, “I am performing the Shraddha of my father, grandfather and great grandfather who are in the form of Vasu, Rudra and Aditya who are born in so-and-so lineage”. In addition to the three paternal ancestors, in Mahalaya Shraddha a resolve is made for the three maternal ancestors, that is, mother, her father and grandfather as also grandmother and great grand mother, wife, sons on whom the sanskar of Holy thread was performed, daughters, paternal uncles, maternal uncles, brothers, paternal aunts, maternal aunts, sister, father-in-law, mother-in-law, Guru, the one who imparts knowledge, guide and those who are born in the same lineage but have no closer relatives in the world, who are dead. · After this, invoke the Holy rivers of Ganga, Yamuna, Saraswati etc. and prepare Yavodak, that is, the water mixed with sandalwood paste, flower, Basil leaf, that is, Tulasi, coins, a betel nut and darbha. · Similarly prepare Tilodak, that is, the water mixed with black sesame seeds and maize and charge it by reciting mantras. · Now he should purify himself by sprinkling the charged water first on himself and thereafter purify the venue of the ritual. There is charged Tilodak in the copper vessel. Due to it, the momentum of the subtle deceased ancestor-frequencies is increased. Due to this momentum, a whirlpool charged with attraction-energy is created. The subtle body is attracted towards the whirlpool. To make the Karmakanda of Shraddha ritual successful, the person performing the Shraddha (host) and the venue of the Shraddha are purified with the charged Tilodak. The various religious rituals in Hindu Dharma are spiritual experiments in themselves. Science originated from the science of Spirituality. Hence, this same process happens in science too. The host of the Shraddha holds in hand a spoon, water pot, darbha and sesame seeds and does circumambulation around the priest. He pays obeisance by prostrating on the ground in the south-east direction. Then placing the Holy thread on the right shoulder he says, “We will keep aside anger, observe celibacy even at the mental level and perform the Shraddha”. The host says, ‘Let me get the authority today to perform the Shraddha of my father and grandfather’. Thereafter he hands over thedarbha to the God-priest. This action is called ‘giving kshan’. Then he gives kshan to the Pitru-priest. Now, in front of the God-priest, the darbha of Yavodak is moved in this manner and a line is drawn with barley. In front of the Pitru-priest, the Tilodak is used first and then black sesame seeds are used. Now circumambulation is done in reverse direction around oneself, that is, from his right to left and the sesame seeds are showered in the eight directions. Then one goes in the kitchen and the charged water is sprinkled on the food. By showering of sesame seeds in the four directions by the host, round circles of frequencies of deceased ancestors are created in the premise. The subtle bodies of the deceased ancestors situated in the premise are attracted to these circles. By doing this ritual the premise gets the form of the region of Pitar. Now the Holy thread is placed on the left shoulder and sitting in front of the God-priest a prayer is said, ‘O Vishvedev, the most powerful one ! Please come here and get this ritual done attentively. Now the Holy thread is placed on the right shoulder and sitting in front of the Pitru-priest a prayer is said. Then barley and darbha are placed below the God-priest and a seat is offered to Vishvedev. Two vessels for giving ‘arghya’ are kept in the front and Yavodak and barley are put in it. These vessels are charged withmantra. Now transferring the barley from left hand to right hand, he puts it on the body of the priest, from the feet to the head. The remaining barley he keeps on the ground and gives ‘arghya’ with the right hand. He performs worship with sandalwood paste, flowers, incense stick and a lamp. · The host takes the Holy thread on his right shoulder and hands over the sandalwood, maize and a flower to the Pitru-priest. He waves incense stick in an anti-clockwise direction and performs arati with a lamp. · The betel nut, darbha and sesame seeds are placed in the hands of the Pitru-priest and with this the rituals of this worship are complete. · The host says, "If there is any mistake on my part in the worship, please forgive me." · Water, flower and sesame seeds are put in the vessel kept in front of the Pitru-priest. · Placing a hand on the vessel, it is charged with mantra. · Now the sesame seeds are put on the body of the Pitru-priest right from the feet to the head. · Now ‘arghya’ is offered to the deceased ancestors. After this the host stands in one place and does circumambulation around himself. Let the ancestors residing on Earth attain an evolved region. Let the ancestors who are in heaven, that is, at a higher plane of existence, never degrade. Let the ones who are at a medium plane of existence, attain a higher plane. Let the ancestors who symbolise the Truth protect us. Also, prayer is offered to the ancestors for the continuation of the lineage, ‘O Pitru-deities, give birth to a son like Ashwini Kumar, who is beautiful, healthy and who can fulfil the wishes of Deities, ancestors and all humans. O ancestors, give me a valiant son. Another prayer is, 'Since the time of the origin of the Universe to date, whoever was born in the lineage of my mother and father and all the servants from these two lineages and my past births, those supported by me, those serving me, friends, disciple, pets, the plants and trees planted and cut by me, the close relatives, those who incurred favours from me and those who bestowed favours on me, get the food offered by me. It is evident from this prayer that the Hindu Dharma teaches us to express gratitude not only to our own but also towards our benefactors, other beings and trees and plants. 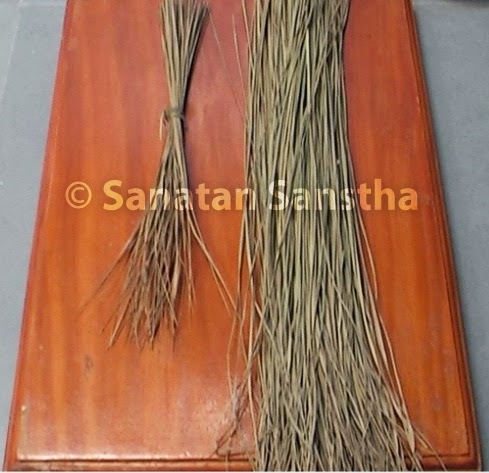 · If there is impurity due to birth or death in the family on the day of the shraaddh, then after its completion consumepanchgavya, change the Holy thread and do shraaddh. Alternatively, perform shraaddh on the first no moon day after the impurity is over. · After commencing the ritual of shraddha if impurity due to birth or death occurs in the family but outside the house, then do not follow the regulations of impurity till the completion of the shraaddh. If it happens in the house, then stop the shraddhaand only after the observance of impurity is completed, do the shraddha again. · If the wife of the one who performs the shraddha has menses, then Mahayala can be done any time after those five days. When the lady performing the shraddha has menses then no regulations need to be followed. · If the shraddha falls on Ekadashi, then the person performing the shraddha should merely smell the meal of the shraddhaand offer it to a cow or one should perform Hiranya-shraaddh. Hiranya-shraaddh is a shraaddh done merely by offering donation (dakshina) without offering meal. · During eclipse, take a bath and do shraddha even if there is impurity. Here two points become evident. One is that every ritual has been considered subtly from a worldly perspective in Sanatan Hindu Dharma. The second is that women can also perform shraddha. For the subtle body (linga deha), the interval from the time of death to the next birth is similar to that of a foetus in the womb. Due to the mantras of the shraddha, the blessings of the brahmins, the good wishes of the relatives and pinda-dan etc. the deceased ancestors acquire a protective sheath and get the momentum to progress. For many years shraddha was not performed in our house. During Pitrupaksha, I would see many human figures around me. They would try to touch me; but I would chant ‘Sri Gurudev Datta’, that is, the Name of Lord Dattatreya. Hence, I was protected from them. After watching the satsang series about Pitrupaksha, I learned that during this period the deceased ancestors come close to us. After that our family decided to perform shraddha on Sarvapitri Amavasya. After the shraddha ritual the ancestors blessed everyone in the family and left. - Master Advait Menon, Goa. Performing shraaddh on the chaturthi or panchami on the Bharani asterism in the Pitrupaksha has a special importance. If possible doing the shraaddh on the Bharani asterism in addition to the tithi of death of the person helps the subtle body of the dead to be liberated from the form of being of the dead. There is a subtle cover of desire-frequencies associated with the Absolute Earth and Water Principles on the gross structure of the land of Gaya. This cover is contained in a triangular structure. Hence, performing shraddha at this place is more beneficial for the deceased ancestors’ whose inferior level desires have remained unsatisfied. The Bharani asterism that falls in the Pitrupaksha is also made of a triangle of three stars. The Deity of this triangle is Lord Yama. The Yama frequencies active in the Universe in higher proportion on this day are associated with desire-energy. When performing shraddha on this tithi, the desire-frequencies on Earth associated with this asterism are activated. Due to this, the place of shraddha becomes akin to that in Gaya. In the ritual of shraddha performed on the Bharani asterism, the Yama frequencies are activated in higher proportion. 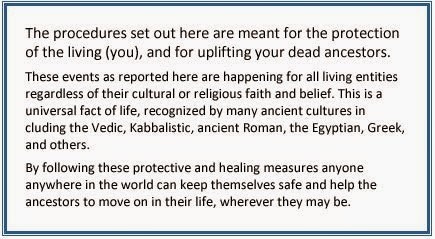 The deceased ancestors benefit from these frequencies. The woman who dies before her husband is called ‘avidhawa’. Her shraddha is performed on the tithi of Navami of Pitrupaksha. So this Navami is called ‘Avidhawa Navami’. The shraddha of a dead married woman should be performed on the Navami of the Pitrupaksha by the son or the husband. In this shraddha married women are served a meal and ritualistically offered a coconut, sari and a blouse piece. As long as the husband is alive, both the Avidhawa Navami and yearly shraddha should be performed. On the tithi of Trayodashi, a ritual of Kakabali is performed for the dead children. On the day of the Chaturdashi of Pitrupaksha, theshraddha of those who died in accidents is performed. The Amavasya that falls in the Pitrupaksha is the last tithi of Pitrupaksha. If it is not possible to perform shraddha on any day of the entire year, it is very essential that a shraddha be performed for all the dead on the tithi of Sarvapitri Amavasya. According to the Scriptures, the Amavasya of the Pitrupaksha is the most appropriate tithi for the ritual of shraddha. During the shraaddh rites and the meal, one should not entertain anger and meaningless thoughts. The vibrations generated due to the meaningless thoughts adversely affect the Vishvedev and the deceased ancestors (Pitars) coming to that place. That is why one should completely avoid the meaningless thoughts and the meaningless conversation with others while performing the ritual. · If brahmins are not available for performing the shraddha ritual of one’s mother, then one can invite married women and perform the shraddha. · If two brahmins are not available then seat the brahmin on the seat for Pitars (Pitrusthan), place an idol of Shaligram or baby Krushna on the seat of the Deity (Devasthan) and make a resolve to perform the shraddha. · If due to some reason one is unable to perform shraddha, then he can get the shraddha performed through his son, disciple or a brahmin. · Invite a brahmin, after he has washed his hands and feet, offer him a seat and after worship with five substances offer him a meal. · In case of unavailability of money and brahmin, do a shraddha with sacrificial fire (Homa-shraddha). 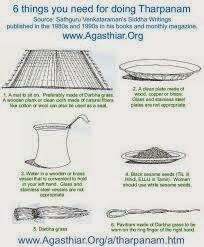 · Give a pitcher filled with water to a brahmin. · Give some food to a brahmin. · Give sesame seeds to a brahmin. · Give some money to a brahmin. · Give food grains as per capacity to a brahmin. · Feed grass to a cow. · Forgoing rituals etc. merely do pinda-dan. 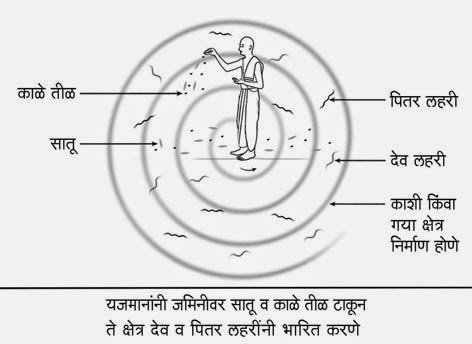 · After bathing release water containing sesame seeds (Pitru-tarpan). · Observe a fast on the tithi of the shraddha. · On the day of the shraddha, recite the shraddha ritual. If even this is not possible, then go to a forest and exposing your armpits by putting both the hands up, wave a blade of grass towards the Deities of the regions (Lokapal) like Sun etc. and pray, "I do not possess anything useful for shraddha like wealth etc. I pay obeisance to all my Pitars. Let all my Pitars be appeased with my devotion. I am helpless." Alternatively, go to a secluded forest and pray in a loud voice raising your hands, I am penniless and without food. Liberate me from the debt of my Pitars. If even this is not possible, then lament facing the south direction. This information in Hindu Scriptures shows how inevitable it is for everyone to perform shraddha. 3. How is the benefit of the shraddha acquired merely by praying ? By praying with spiritual emotion the Pitars, inferior Deities and other Deities are appeased and attracted towards the person who prays. 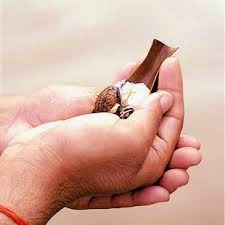 Together with their blessings the person also acquires the benefit of the shraddha. Invoking the Deities by raising hands and praying to the Pitars is a symbol of the devotee’s spiritual emotion (Bhav) of helplessness. Due to the unsatisfied Pitars there is a risk of distresses like not getting married, financial difficulties, seeing cobra or Pitars in a dream or in waking state. For overcoming such distress, it is important to chant the Name of Lord Dattatreya along with the ritual ofshraddha. 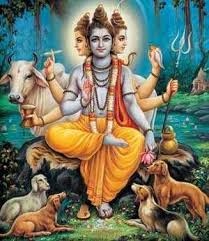 Deity Dattatreya is the Principle created from the combination of the Principles of the three main Deities, Brahma, Vishnu and Mahesh. One of His functions is to give momentum to the journey of our deceased ancestors (Pitars) to the next region. Hence, once should chant ‘Shri Gurudeva Datta’. · The Pitars getting momentum in their onward journey and reduction in the distress due to them: Many desires of the person attached to materialistic life remain unfulfilled after death. Such unsatisfied subtle bodies get trapped in the region of the dead (Mrutyuloka). Such subtle bodies cannot go to the next region because of their unfulfilled desires. 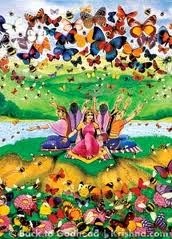 By chanting ‘Sri Gurudeva Datta’ Pitars trapped in the Mrutyuloka gain momentum. · Creation of a protective sheath: By chanting ‘Sri Gurudeva Datta’ a protective sheath is created around the body of the person. Keeping in mind this benefit of chanting ‘Sri Gurudeva Datta’, one should do maximum chanting during Pitrupaksha. To avoid the risks of future distress due to unsatisfied Pitars and as spiritual healing for mild distress, chant for one to two hours daily. If the distress is medium, chant for two to four hours daily and if it is severe chant for four to six hours daily. · Put up the Name-strips of ‘Sri Gurudeva Datta' in the room where shraddha ritual is done. · Play the audio of the chant ‘Sri Gurudeva Datta’ in low volume. · Before the shraddha, worship the sattvik picture of Lord Dattatreya and offer arati. With these actions the obstacles of the negative energies in the ritual of shraddha are removed. The Energy and Chaitanya of Lord Dattatreya is emitted in the venue of the shraddha and the family gets its benefit. 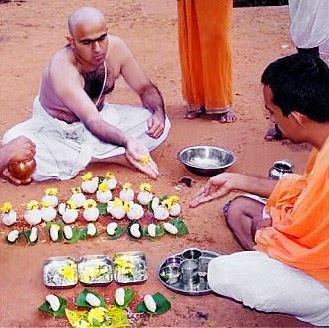 The important and requisite components for the shraddha ritual are Darbha, Bhrungaraj leaf, Tulasi, black sesame, white rice, barley, honey, black gram, white fragrant flowers etc. Red coloured flowers are forbidden in the shraddha ritual as destroyer frequencies are emitted from them. Fruits like the Indian gooseberry (amla), pomegranate, musk melon (kharbuja) are specially used in the shraddha ritual. Darbha is a very important component in the shraddha ritual. Darbha generates radiance (Tej). When Darbha is used in theshraddha ritual, by the influence of the frequencies of Tej emitted by Darbha, the interference of raja-tama particles in each ritual of the shraddha is reduced. The deceased ancestors (Pitars) absorb the energy of a specific level from the ritual. The subtle air associated with the Tej particles in the Darbha is activated by the recitation of mantras of the shraddha ritual. This air attains momentum in the upward direction with the help of the Absolute Air Principle of the external atmosphere. With this the resolve made in the shraddha ritual becomes efficacious in lesser time. 1.2 How should the Darbha be selected ? Meaning: For the purpose of shraddha of the Pitars, pluck the Darbha along with its root. The reason for this is that we can gain victory over the Pitruloka with the help of the root of the Darbha. The Water Principle-dominant particles of Tej in the Darbha with roots are conducive for disintegration of raja-tama particles. The energy emanating from the actions done with the Darbha with roots touches the subtle sheath of the Pitars in a shorter time. In addition to gaining victory on the Pitruloka, that is, causing disintegration of raja-tama particles at each level of Martyaloka (the subtle region of the dead), the Pitars also get the strength of Tej. The raja-tama-dominant sound frequencies generated by hitting many times on the Darbha or cutting it with the nails are spread in the Darbha, which reduces the sensitivity associated with sattva of the Darbha. The ability of the Tej Principle-dominant air emitted by the Darbha to move in the upward direction is also reduced. Hence, the proportion of benefit accrued from the shraddha ritual is reduced. Reciting this mantra, face the north-east direction on the Amavasya of Bhadrapad as per Shaka Samvat or of Ashwin as perVikram Samvat and say ‘Hum Phat’ and pluck the Darbha. Darbha represents all the components of inferior or superior level. Hence, in the absence of any specific component, Darbha can be installed at that place. The inherent Tej particles in the Darbha attract the superior frequencies of the Deities and the inferior frequencies of the Pitars as per requirement and invite them at the venue of the shraddha. The inherent air associated with the TejPrinciple in the Darbha is activated by the with-resolve recitation of mantras of the shraddha. This activated Tej Principle is emitted by the Darbha. The negative energies are prohibited by the emitted Tej Principle from coming to the venue of the shraddha and thePitars are attracted to that venue. Due to the ability of the Darbha to attract the Principles of superior Deities, it is used as the smallest particles of Divine Consciousness (pavitrak) in each ritual of worship. Using black sesame seeds in the shraddha means invoking the deceased ancestors (Pitars) trapped in the Martyaloka with the help of the raja-tama frequencies emitted from the black sesame seeds. The recitation of mantras in the shraddha has an effect on the black sesame seeds. The dormant raja-tama energy in black sesame seeds is awakened as a result of the sound energy generated by the recitation of mantra. 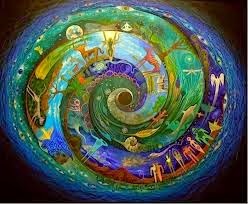 This energy is emitted into the environment in the spiral form of raja-tama vibrations. At that time, according to the invocation made in the shraddha, subtle bodies of particular Pitars are attracted towards these vibrations and enter Earth's environment. In this process, with help of the raja-tama frequencies emitted from the black sesame seeds, reaching the place of shraddha ritual becomes easier for the subtle bodies of Pitars. Black sesame seeds are showered at the place of the shraddha by the host. Due to the frequencies of Pitars getting attracted towards the black sesame seeds, the place of the shraddha becomes charged with the Pitar frequencies. The Desire sheath present around the subtle bodies gets activated due to the frequencies emitted from the black sesame seeds and the Pitars get satiated by partaking their portion of shraddha in air form. In shraddha, water containing black sesame seeds charged with mantras (Tilodaka) has special spiritual importance. The copper platter contains charged Tilodaka. Money to be offered to the Brahmin, leaf of Bhrungaraj, Sandalwood, flower and beetle nut are placed in it. The momentum of subtle Pitar frequencies increases due to the black sesame seeds in the Tilodaka. As a result, a whirlpool with attraction energy is generated. The subtle body is attracted towards this whirlpool. Thus, the subtle body attracted towards the whirlpool with attraction energy formed from the Pitar frequencies having momentum enters the Earth region. The change occurring at spiritual level during performance of ritual is a feature of spiritual practice of rites, rituals and observances performed at the physical level (Karmakand) prescribed by Hindu Dharma. After the host pays obeisance to the Dev-brahman and Pitru-brahman, the brahmins bless the host by showering unbroken rice (akshat) on him. Unbroken rice should be used as akshat. 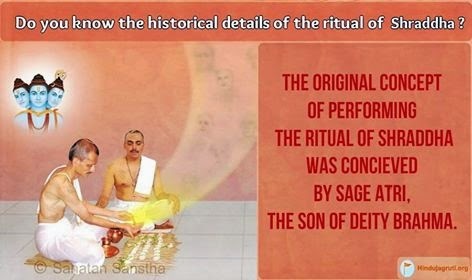 In the shraddha ritual barley is also used. 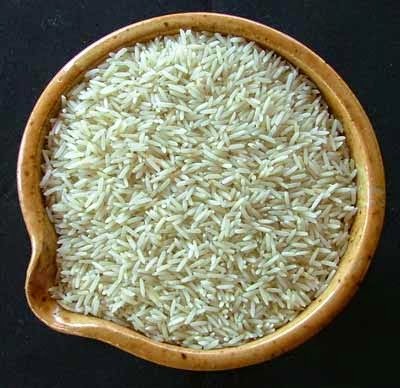 White unbroken rice is used if barley is not available. frequencies,tamasic energy is generated. Movement of raja-tama particles gains momentum. 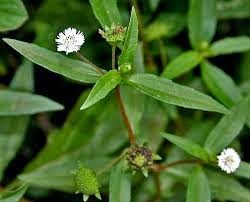 To restrain this momentum, these two substances, maka, that is, leaf of Bhrungaraj and Tulasi are used. The Tej frequencies emitted into the atmosphere by Bhrungaraj leaf restrain the momentum of raja-tama particles generated from the unsatisfied desires of the Pitars. The frequencies of Chaitanya of Sri Krushna principle emitted from the Tulasi leaves easily destroy raja-tama particles. Thus Bhrungaraj leaf and Tulasi complement each other in purifying the atmosphere. Due to this purity, entering the place of shraddha becomes easy for the Pitars. · Slowing of momentum of raja-tama particles. The energy of attraction generated in the raja-tama particles disintegrates due to the Tej frequencies emitted from the Bhrungaraj leaf. · Division of raja-tama particles. Due to the Tej frequencies emitted from the Bhrungaraj leaf, the ability of the raja-tamaparticles to function collectively reduces. The brahmin invited for the place of the deceased ancestors (pitars) in the ritual is seated facing the north. He is called the pitar-brahman. The brahmin invited for the place of Deity in the ritual is seated facing the east. He is called dev-brahman. A small square is marked with water on the ground in front of the Dev-brahman from the northwest to the northeast and the banana leaf is placed on it to offer the meal to him. A circle is marked on the ground with water in front of the pitar-brahman in the same way. 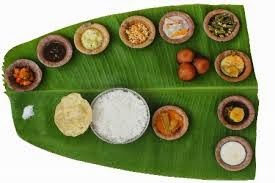 Thereafter the meal is served on leaves to the Family Deity, Deities worshipped traditionally in the house, cow, for pindbhojan etc. 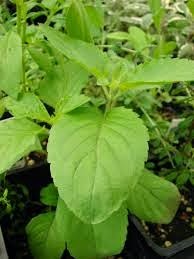 A sheath of Holy ash (bhasma) is drawn around the leaf to prevent negative energies from creating obstacles in the meal. · Offering oblation in the fire (Agnoukaran). In the Rugved period, pitrupuja was performed by offering the pinda as oblation in the sacrificial fire. · Pindpujan, that is, offering the pinda. In agnoukaran ritual, ghee is first smeared on the leaves to purify them. The person performing shraaddh sits in front of the pitar-brahman, places cooked rice on a small leaf, and puts ghee on it. This heap of rice is parted in two with the help of a darbha. Fire in the form of darbha is installed on the hand. 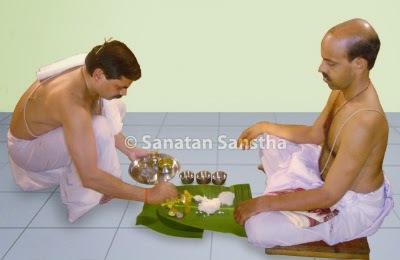 After making two parts of the rice, the person performing shraddha picks up some rice from the center of the rice on the north side in his right hand. He smears it with ghee by his left hand and places it in the hand of the pitar-brahman. This action means, oblation to pitars in the form of Soma, that is, Deity and to fire. A rule laid down by the Vedas is, The entire world is in the form of fire (Agni) and Soma. In the agnoukaran ritual, by offering oblation of rice in the form of Soma Principle in the fire which is in the form of darbha, the pitars get the essence of food. 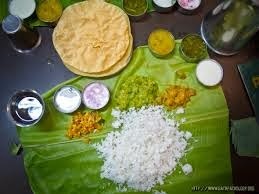 For this meal, food items are served on a banana leaf in a specific manner. The person performing the shraaddh sits in front of theDev-brahman by placing his folded right knee on the ground and offers the leaf to Vishvedev. Then by holding the right hand of theDev-brahman, meal is offered to Vishvedev. A prayer is made, ‘Let this food be partaken’ and also, ‘Let the fruit of offering food close to Vishnupad at Gaya ji be acquired. In the ritual of shraaddh, reference to Gaya ji appears many times. The place, Gaya ji is charged with subtle, inferior desire vibrations. Hence, shraaddh performed there is more fruitful. · The banana leaf is offered to the pitars by placing the bent left knee on the ground in front of the pitar-brahman. 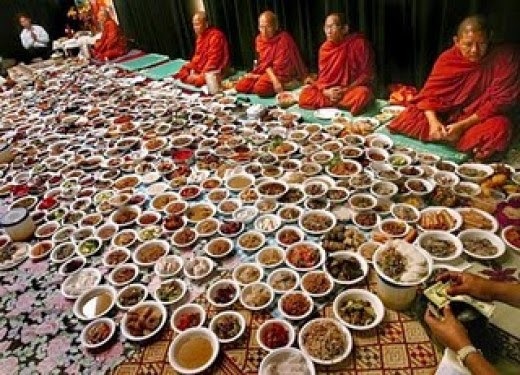 · The food is offered by holding the hand of the pitar-brahman in a reverse manner. 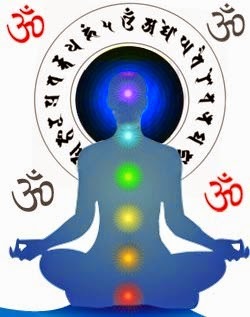 · Now the person performing the shraddha says, ‘I have offered you the meal considering you in place of my pitars of this particular lineage (gotra). Please partake it. Let me acquire the fruit similar to food offered at Gaya. · Now both the brahmans offer pranahuti. · Shlokas should be recited during the meal of brahmans (brahman bhojan). The Moon channel gets activated by sitting with the right knee on the ground. Hence, the person performing the shraaddh can easily receive the frequencies of Deities. The Sun channel gets activated by sitting with the left knee on the ground. Sun channel is associated with raja guna. It becomes easier to invoke the pitars with the help of this raja guna. In a way, brahman bhojan is an oblation given in the fire present in the stomachs of the pitars and Deities. 4. How are the pitars in various forms of existence satisfied by the food offered in the ritual of the shraaddh ? For the nourishment of the physical body, gross food is necessary. Deceased ancestors do not have the sheath of the physical body (annamaya-kosh) but have the mental sheath (manomaya-kosh) containing desires. Stomach getting full and becoming satiated are two different things. As per the Science of Spirituality, getting satisfied is associated with the subtle body. The necessary subtle essence of food is carried to the deceased ancestors, in the form of Divine nectar if they are in Deity form of existence, as edibles if they are in the celestial being form of existence and as meat if they are in the form of demons. 5. If a person (Jiva) is already reborn, what is the use of taking his name? To give the portion offered to the deceased ancestors in the shraaddh to the particular subtle body is the responsibility of the Deities of Pitruloka. The mental sheath, that is, the baggage of previous birth accompanies a person. The action addressed to this baggage definitely reaches there. If without any reason we suddenly feel satiated on some day, we can surmise that somewhere our son from the previous birth has performed our shraddha. The Pindapujan has been mentioned in the Yajurveda, Brahman, Shrutis and the Gruhya Scriptures. According to Mahabharat, Varahadeva, the incarnation of Sri Vishnu, gave complete information about shraddha to the world. He took out three pindas from His molar tooth and kept in the south direction on a darbha. Proclaiming that ‘these three pindas should be considered as the forms of the father, grandfather and great grandfather’, He performed ritualistic worship of the pindas with sesame seeds. After offering a pinda for those about whom one has definite information, a Dharmapinda is offered. This Dharmapinda is given to the deceased ancestors who are in the Hell region of Asipatravan and Kumbhipak, those whose family lineage has ended and others. Kajal is made by mixing ghee with burnt darbha. The deceased ancestors in the form the pinda are offered kajal, a thread of wool, a flower, a Tulasi leaf, maize, incense, lamp etc. They are then offered Holy sacrament (naivedya), water for drinking, washing hands and cleaning the mouth and a betel leaf for mouth freshness. Now the person performing the shraddha stands, offers barley and black sesame seeds and says, “O my deceased ancestors! I Pray for food and strength for my family and that all should progress. O deceased ancestors! Grace us with wellbeing.’ Thereafter the Pitru-brahman is given Tilodak and the Dev-brahmin Yavodak and water is released on the pinda. Tilodak is offered on a special pinda made for those deceased ancestors who had died by burning in fire or who died in the womb. The person performing the shraddha asks, ‘Are the Vishvedev appeased ?’ ‘Are the deceased ancestors appeased?’ After saying, ‘Let all the Deities be appeased and the karma of shraddha be done as per the Scriptures’, the person performing the shraddhapays obeisance. The priests say, ‘'Let the desire of the person performing the shraddha be fulfilled by the grace of Deities and the deceased ancestors’'. Thereafter, the other members of the family pay obeisance to the pindas. After this, the person performing the Shraddha remembers the seven places that bestow Final Liberation; Ayodhya, Mathura, Gaya, Kashi, Avantika, Dwaraka and Jagannathapuri and places the pindas in a big vessel. The person performing the shraddha pays obeisance after the conclusion of the ritual. The pindas are immersed in clean flowing water before sunset. Food is served on a leaf outside the house for the crow. In the ritual of tarpan, first tarpan is done for the Vishvedev and thereafter for the deceased ancestors. The person performing the shraddha says, ‘I am offering water, I am offering water, I am offering water in the name of so-and-so relative of so-and-so name in the form of Vasu or Rudra or Aditya of so-and-so lineage, that is, gotra.’ Thereafter for the sake of those born in the family lineage (gotra) who had no sons, a corner of a cloth is dipped in the Tilodak, the cloth is squeezed and water is released. If a person performs shraddha using mere grass but with faith and devotion, then nobody in his family becomes unhappy.